A Lossiemouth woman has danced her way to success – leading the way for her sisters. Holly Lazenby was beaming yesterday after she picked up her MA business management degree from Aberdeen University. The 22-year-old said she had thoroughly enjoyed her four years in the Granite City, picking up new skills beyond the lecture hall. 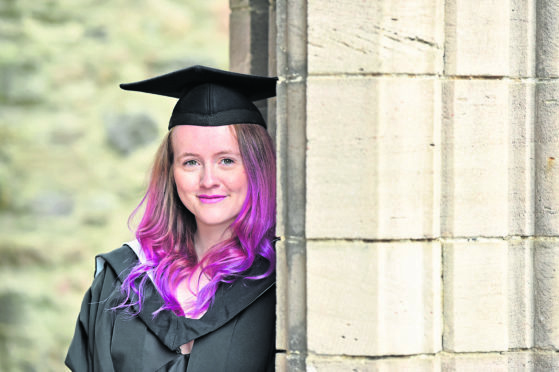 She said: “I was so nervous waiting to graduate, but I really enjoyed it. I picked Aberdeen because it was really valued at the time and close to home. Miss Lazenby specialised in the Latin American salsa and cha-cha, managing to expertly balance her love for dance with her studies. She also took the time to fundraise and volunteer for development charity Childreach. She was supported at yesterday’s ceremony by her mum, dad and boyfriend. “We weren’t sure what she was going to do after she left school,” said her father, Andrew. After summer Miss Lazenby will study business psychology at Heriot Watt University in Edinburgh.